In Part I, this series examined Julia Gillard’s experience as the first (and thus far only) female Head of Government in Australia. In that piece, I explored Australia’s foreign policy agenda under Gillard’s Labour Government and the difference, if any, Gillard and her team made championing for change for women abroad. Under Gillard, Australia continued to promote an economically driven foreign policy agenda – one that has been criticised for orienting itself around market access and what makes ‘economic sense’ (True, 2017). Moreover, our Overseas Development Assistance (ODA) remained low under Gillard, reaching 0.361 per cent of gross national income in 2012, albeit the highest it has been in the last decade (OECD, 2018). In Part II, I will examine Australia’s foreign policy agenda under Gillard in greater depth and draw comparisons to more progressive examples of so-called ‘feminist foreign policy’, specifically in Sweden and Canada. Under Gillard’s leadership, overall, our foreign policy focused on improving relations with Asian nations and advancing Australia’s status as a global player before the Asia-Pacific Economic Cooperation (APEC), the G20 and the World Trade Organization (WTO). Nonetheless, Australia took many practical steps towards advancing gender equality in countries abroad. This included an investment of AUD 320 million to make practical improvements in the lives of Pacific women (Government of Australia, 2012). Yet, this ‘solid integration’ (OECD, 2013: 17) of gender, so praised by the OECD, is far from what we could understand to be a “gendered foreign policy”. Its approach to gender is comprehensive. From the perspective of Margot Wallström, Sweden’s Deputy Prime Minister, Minister for Foreign Affairs and Minister for Nordic Cooperation, Sweden’s foreign policy agenda takes account of gender in trade agreements; invests in promoting an increase in female participation in politics (with evident success in some countries, like Somalia); advocates for all United Nations resolutions to take account the rights of women and girls; finances training for peace mediators in Latin America, Africa and the Middle East; and included the founding of the Global Initiative for Climate Justice, with a clear message concerning how global warming has a greater negative effect on women (Sahuquillo, 2018). It has done all of this without having had a female head of state or government in the last 300 years. Another country often considered comparable to Australia in terms of development and history: Canada – again under a male Prime Minister, Justin Trudeau – is said to be emulating Sweden (Chalaby, 2018). Canada’s female Minister for Foreign Affairs, Chrystia Freeland, has been pushing for a feminist amendment to the North American Free Trade Agreement (NAFTA) – NAFTA 2.0 with a gender chapter (Rhodes, 2017). Yet, as a trade agreement that the U.S. President Donald Trump has been vocal in opposing, it is not yet clear that Canada will succeed in their gender agenda. Canada wants to see more attention in NAFTA to female workers and entrepreneurs, such as gender sanctions for imports from sectors where women face particular barriers to equal workforce participation or where female workers are known to face poor working conditions, such as below minimum-wage pay. This could be a strategy to hide a protectionist agenda against Mexico. Nonetheless, one could argue that a protectionist agenda couched in pro-women terms - even one that promotes trade barriers - is not to be entirely disregarded in light of the broader goal of promoting a feminist foreign policy. So comparing Australia, under a woman leader, to the feminist foreign policies of Sweden and Canada, Australia’s ‘solid integration’ (OECD, 2013: 17) falls short of the types of strategies we are looking for to challenge gender inequality, at home and abroad, and to give women’s rights the status they deserve. This raises the question: what does it take to succeed? We cannot ignore the fact that both Sweden and Canada’s feminist foreign policy agendas are being introduced under female ministers for foreign affairs. Yet, we should caution against a simplistic approach to the issue. Australia’s first female Minister for Foreign Affairs, who resigned in August 2018, rejected the label of ‘feminist’ (Ireland, 2014). Nonetheless, she paved the way for another woman to follow (True, 2018), in what has otherwise been a male-dominated portfolio. We also have to think about the context in which any leader – particularly women leaders – are trying to foster a change agenda. In this respect, it is unfair to assess the impact of Gillard on the lives of other women without looking at the treatment of her own gender by fellow politicians, the media and (some) fellow Australian citizens. By normalising the use of gender stereotypes and even misogynistic language to undermine Gillard’s leadership, the media and fellow politicians simultaneously discredited the political issue of gender equality, framing even the slightest interest in the issue of gender as ‘a destructive and dishonourable approach to political engagement’ (Trimble, 2016: 311). It is in fact very telling that the first Female President of the Marshall Islands, Hilda Heine, came to power and expressed sympathy for what Gillard had to endure during her leadership. Hilda has clearly proven that it is erroneous to assume that a women leader would fare worse in the Pacific Islands than a nation like Australia. Heine explains that in the Marshall Islands context, “[w]ith women leaders, it is hard for men to criticise us because we are mothers and must be respected. So there are no personal attacks” (Spark, 2018). It is too early to draw any conclusions on Heine’s impact, having become President of the Marshall Islands in January 2016. However, it is worth noting that Heine was a co-founder of Women United Together Marshall Islands (WUTMI), a women’s NGO that runs a range of programs designed “to advance the causes and improve the lives of Marshallese women and their families” (Spar et al., 2018: 1). This makes it clear that it is not only about the context in which you lead; it is also about what you bring to the table in the first place. Over the years to come, we should watch closely what Sweden and Canada manage to achieve. We have already learnt many lessons about what has not worked in the past. These two nations might become the case studies for what does. 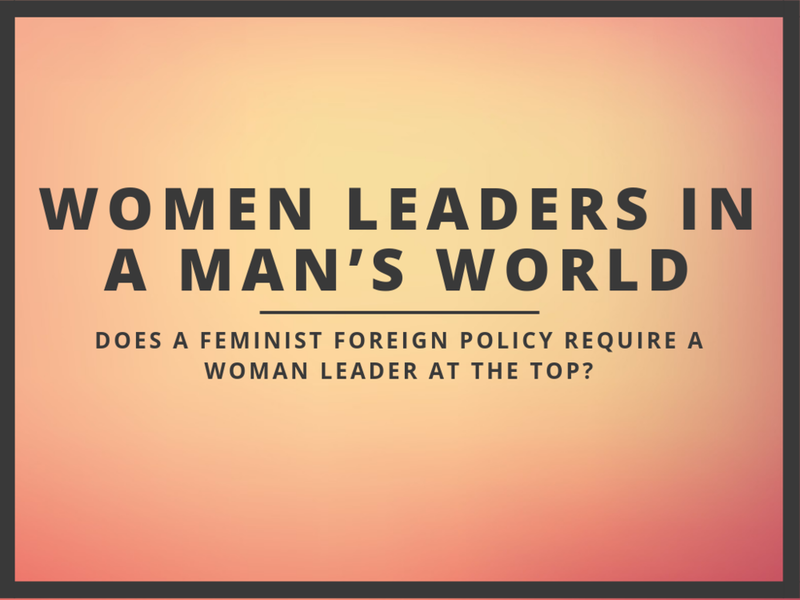 We must also continue to place value on the ‘feminist politics’ of both male and female leaders alike, as well as the people – including those ministers for foreign affairs – who may help to bring some reality to the notion of a ‘feminist foreign policy’. Dr Ramona Vijeyarasa is a Chancellor's Postdoctoral Research Fellow at the University of Technology Sydney, researching the impact women leaders have on the lives of fellow women. Chalaby O. (2018) Canada has a new feminist approach to international trade. In: Apolitical. Accessed 11 May 2018. Government of Australia. (2012) Media Release: Addressing gender inequality in the Pacific. Raratonga: Prime Minister’s Press Office. Government of Sweden. (2018a) Handbook: Sweden’s Feminist Foreign Policy. Access 9 September 2018. Ireland J. (2014) ‘I’m no feminist’: Julie Bishop. Accessed 9 March 2018. OECD. (2013) OECD Peer Review: Australia. OECD. OECD. (2018) Official development assistance (ODA) - Net ODA - OECD Data. Accessed 3 May 2018). Rhodes F. (2017) NAFTA 2.0: Will our feminist government walk the equality talk? The Globe and Mail, 15 August. Accessed 11 May 2018. Sahuquillo M.R. (2018) Suecia, feminismo para todo: desde el quitanieves a la diplomacia. El País, 30 April. Madrid. Accessed 2 May 2018. Spar C., Cox J. and Corbett J. (2018) Being the first: Women leaders in the Pacific Islands. February. Birmingham: Development Leaders Program. Spark C. (2018) Rules of thumb for women leaders in the Pacific, and beyond. The interpreter, 20 February. Accessed 2 May 2018. Trimble L. (2016) Julia Gillard and the Gender Wars. Politics & Gender 12(02): 296–316. True J. (2017) A Feminist Foreign Policy? In: Australian Institute of International Affairs. Accessed 7 March 2018. True J. (2018) Legacy of Australia’s First Female Foreign Minister. In: Australia’s Institute of International Affairs. Access 10 September 2018.